Although the TTC streetcar takes the cake as far as Toronto transit icons go, our buses also have plenty of cachet when it comes to local nostalgia. There's just something about the ritual of commuting that breeds powerful connections to our collective past. 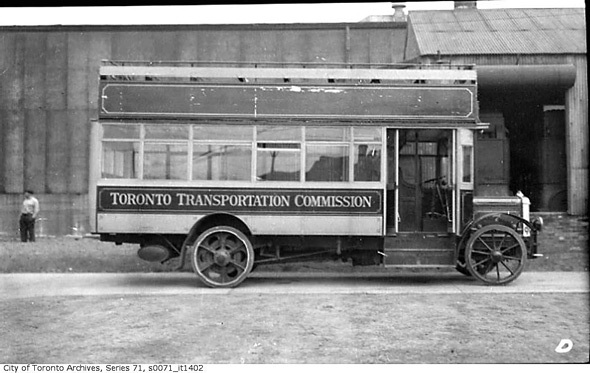 Bus transit in Toronto dates back to the early 1920s, when the city was serviced by a diverse fleet operated by the Toronto Transportation Commission. 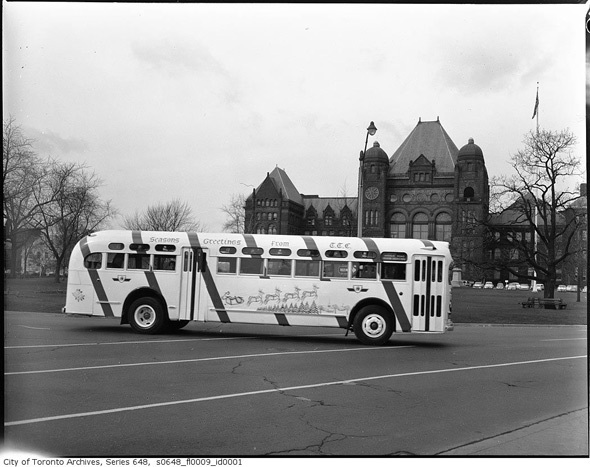 We even had a few double-deckers cruising around town back then, though their time in service wasn't anything like what the city would witness with the GM "New Look" fishbowl buses that rolled along Toronto streets from 1959 all the way to 2011. It's sometimes easy to forget given the state of the fleet today, but the city also once boasted an array of trolley buses. 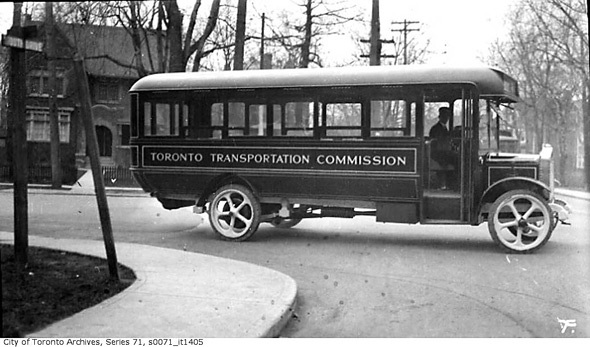 Trolley buses could be seen on Toronto streets in some capacity between 1922 and 1993, but it was in the 60s and 70s that they were a particularly common sight. 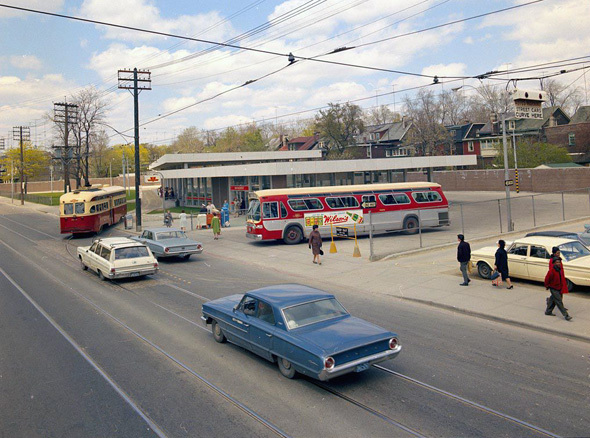 These vehicles made use of existing streetcar infrastructure when the TTC reduced the footprint of the rail network. The last trolley bus to run on city streets was the 6 Bay. 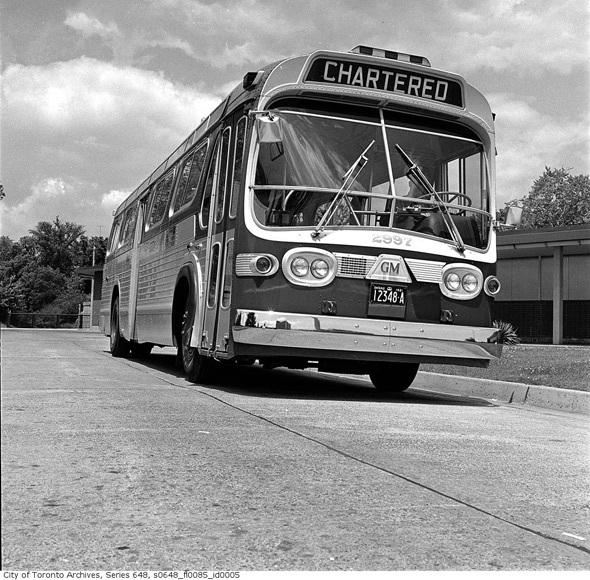 Since then, our streets have witnessed a slew of buses from companies like Orion/Ontario Bus Industries, Nova, and Flyer/New Flyer Industries. Many of them blend in our memory, but the fleet has always been diverse. 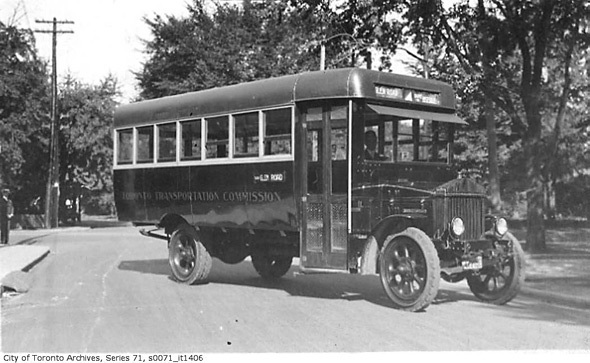 For more on the history of TTC buses, make sure to check out the Transit Toronto archives and photo galleries, which are a tremendous resource for local transit history, including the array of buses that have slowly and steadily served this city over the years. 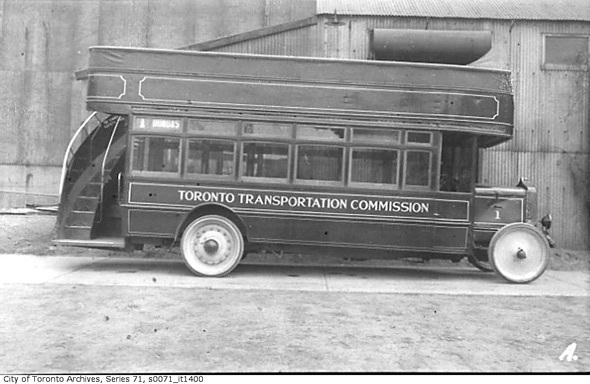 Behold, what TTC buses used to look like back in the day. 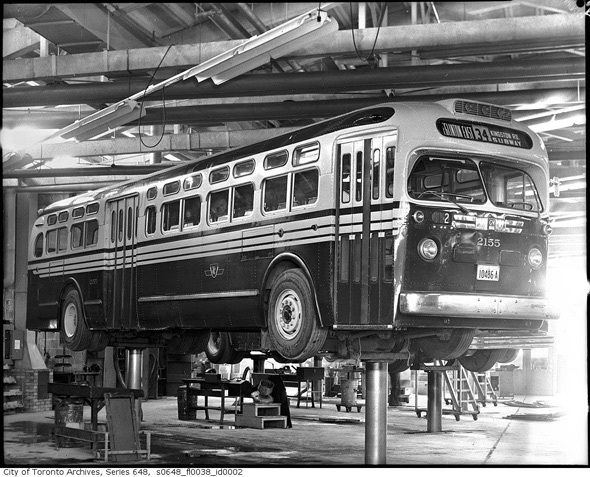 AEC 404 double-decker. Photo via the Toronto Archives. Trolley bus by J Packard. Photo via the Toronto Archives. 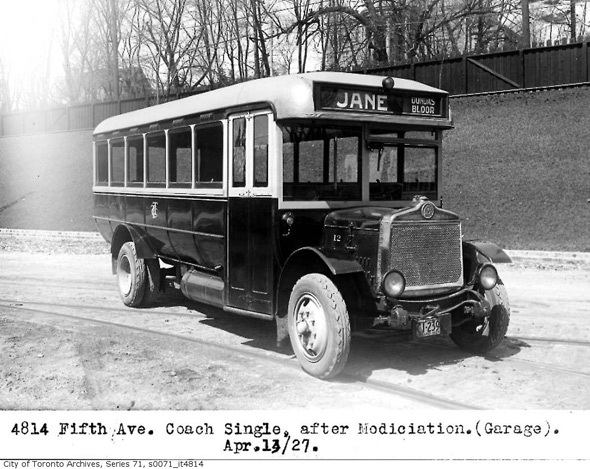 Fifth Avenue J-type bus. Photo via the Toronto Archives. Fifth Avenue single deck model. Photo via the Toronto Archives. Fifth Avenue single-deck variation. Photo via the Toronto Archives. 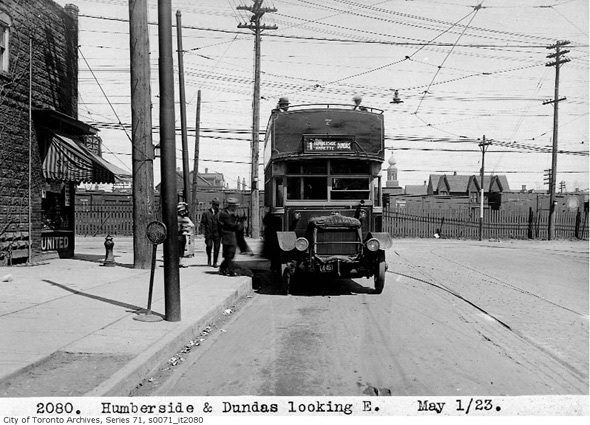 Loading into the Humberside bus 1923. Photo via the Toronto Archives. 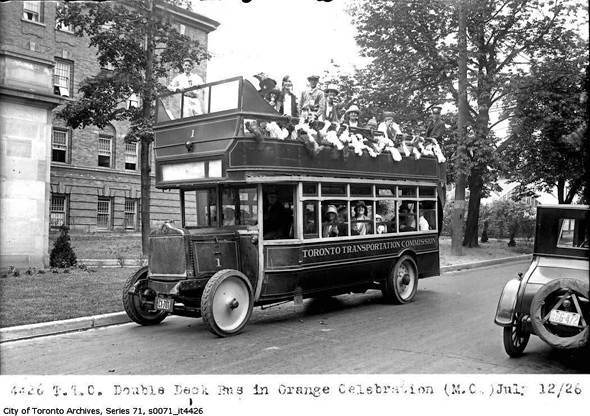 Orange Day celebrations on a double-decker in 1926. Photo via the Toronto Archives. 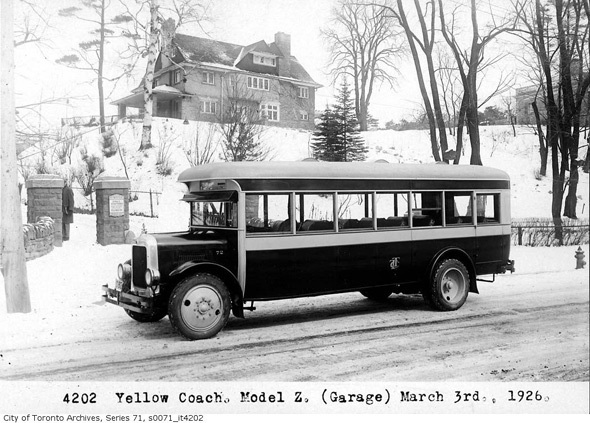 Yellow Coach model Z. Photo via the Toronto Archives. 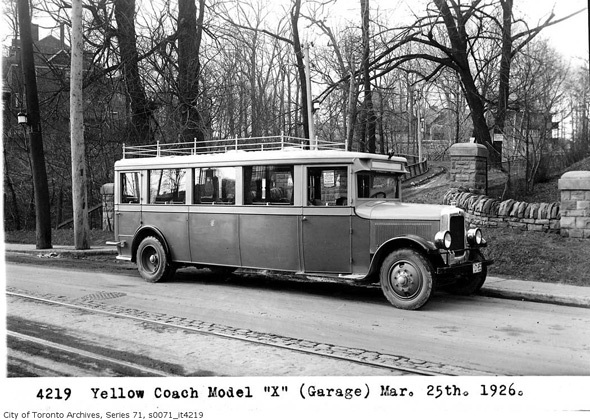 Yellow Coach model X. Photo via the Toronto Archives. 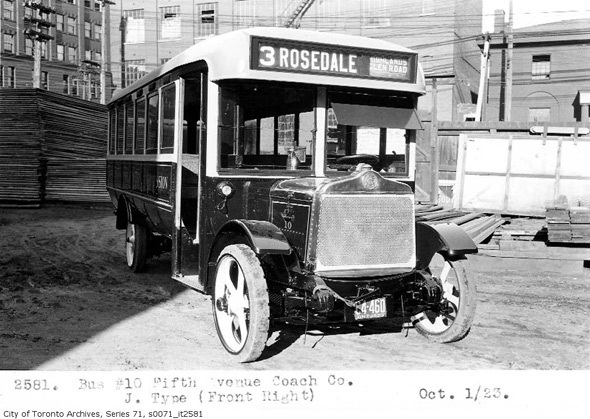 Fifth Avenue Coach in 1927. Photo via the Toronto Archives. 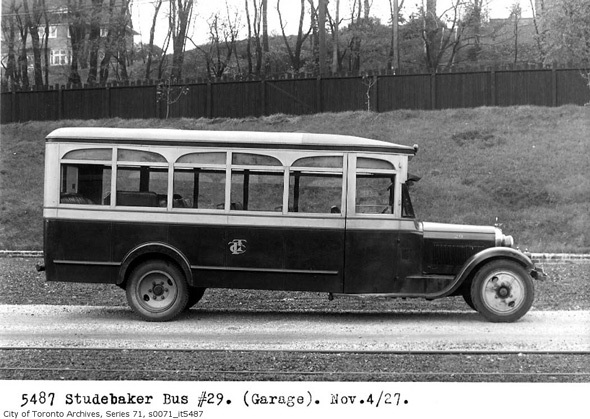 Studebaker Bus No. 29 in 1927. Photo via the Toronto Archives. 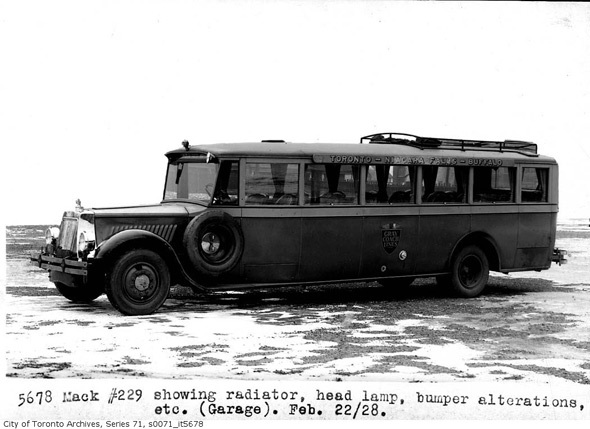 Mack Bus in 1928. Photo via the Toronto Archives. 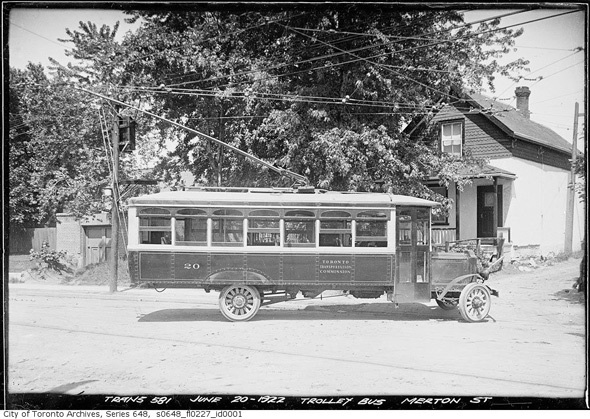 Trolley bus on Ossington Ave. 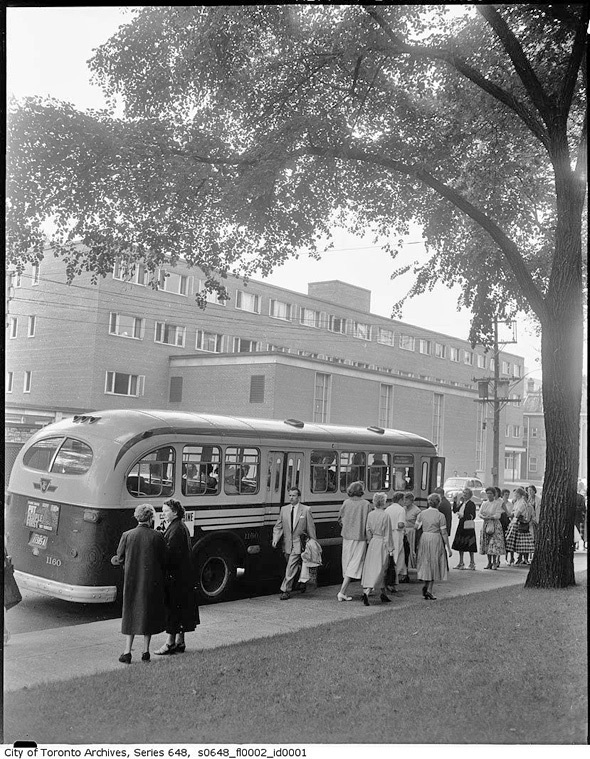 Crowds board a coach in the 1950s. Photo via the Toronto Archives. The Christmas bus in 1957. Photo via the Toronto Archives. Getting painted in 1958. Photo via the Toronto Archives. 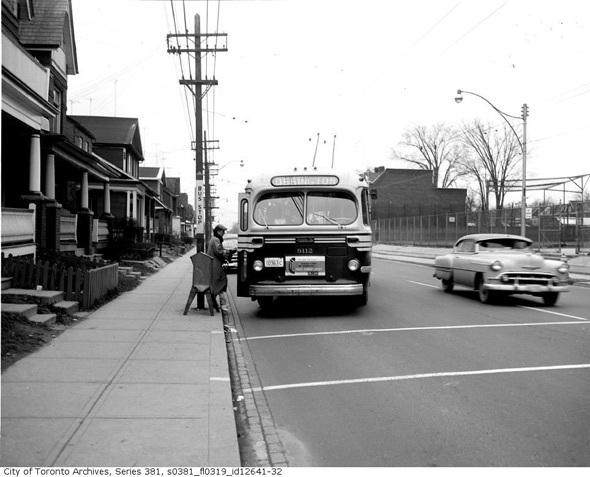 A new bus ready to roll on Eglinton Ave. in 1958. Photo via the Toronto Archives. A mighty GM Fishbowl at Rosedale Station. Photo via the Toronto Archives. 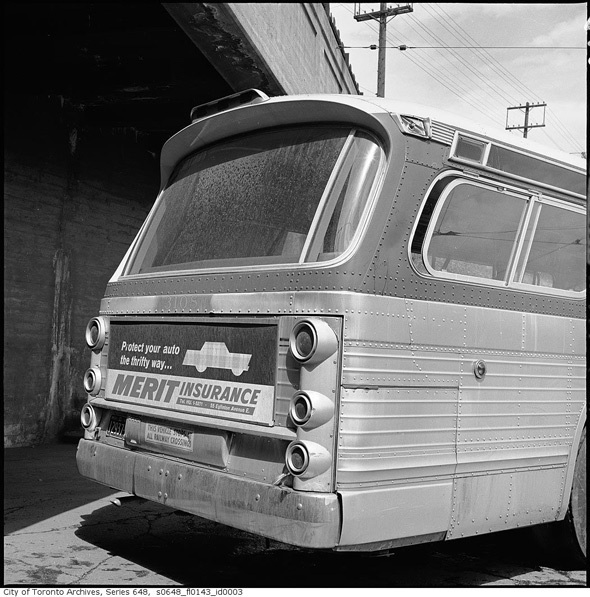 Rear view of GM New Look bus. Photo via the Toronto Archives. A Brill Coach services the Junction 40 bus route in 1968. Photo by David Wilson. A GM New Look passes through the Glen Echo Loop in 1968. Photo by David Wilson. A trolley bus pulls through the Earlscourt Loop in 1968. Photo by David Wilson. A trolley bus and PCC streetcar pass each other on Oakwood Rd. in 1968. Photo by David Wilson. 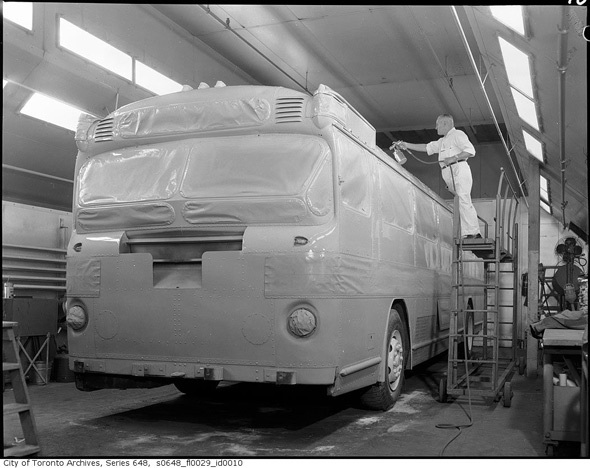 TTC livery on a New Look Bus at Bathurst Station in 1970. Photo via the Toronto Archives. 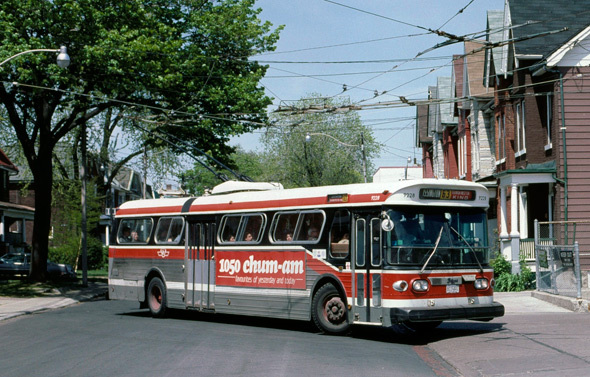 A GM New Look TTC bus wears the red and cream livery in the early 1980s. Photo by Frank Denardo. 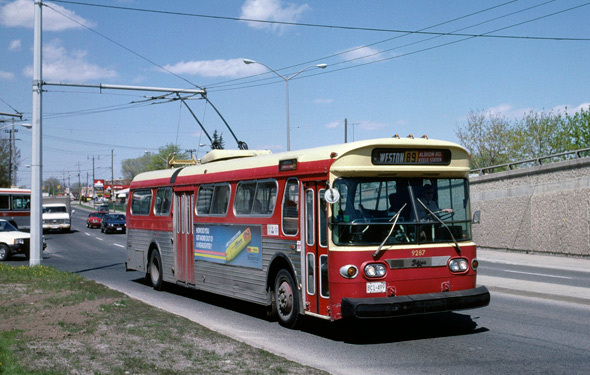 Toronto Flyer Trolley Bus pulling into Ossington Station in 1987. Photo by Steve Morgan. And here's one that's travelling along Weston Rd. Photo by Steve Morgan. 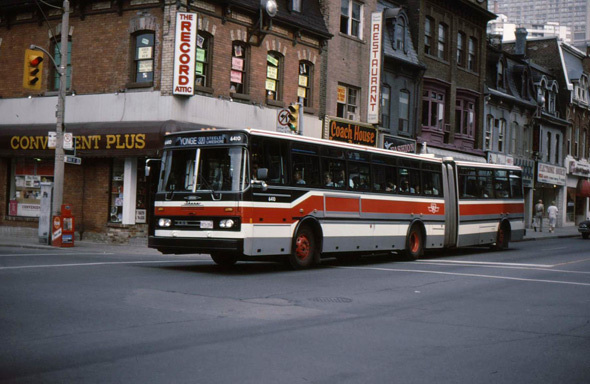 Articulated bus at Yonge and Wellesley in the 1990s via Transit Toronto.